Staying home with the baby I think I can handle. However I am getting a wee bit nervous about my ability to entertain the 3 year-old. This morning she was telling me she was already bored after completing multiple crafts and exhausting her toy options. It was 8:15. In the interest of keeping her occupied and entertained, I thought it would be fun to give her a new play space where she can hang out, talk to her animals, read to her babies, smoke weed, etc. 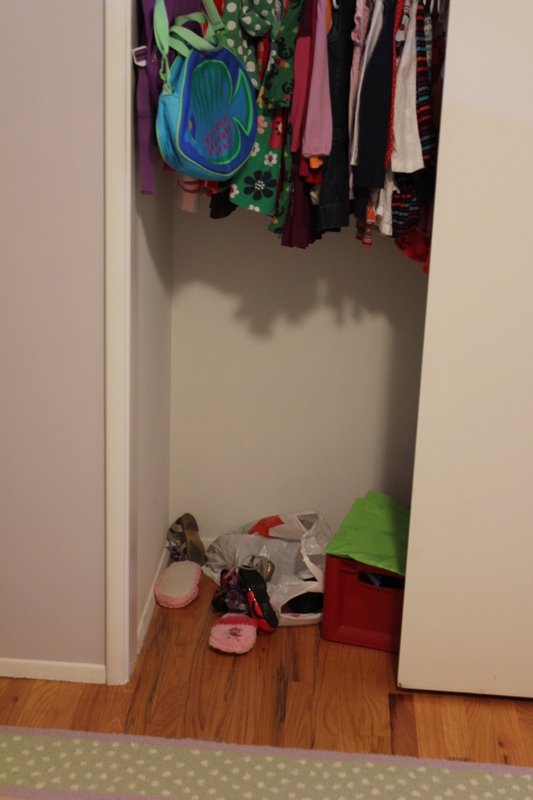 Nearly every inch of our house is taken, so I’m going to convert the bottom of her closet. There’s gotta be something fun I can do with all that dead space. I’m thinking carpet squares or a floor pad, flowers and butterflies on the wall…maybe lights somehow to make it cozy. Of course I fear it will take me hours to create, she’ll like it for 20 minutes and then be tired of it – but I’ll get her involved in creating it and that’ll hopefully stretch out the entertainment value. Or at a minimum, it better at least buy me until 8:30.